The following picture was used in a case study for gender identification at St.Mary's Hospital. Look at both dolphins jumping out of the water. Both dolphins are identical. The researchers concluded that a person is confused about his/her gender if he/she finds both dolphins different in size, shape and appearance. If there are many differences found between both dolphins, it means that the person is experiencing a great doubt regarding his/her gender. I did not find any difference between the two dolphins. which gay researcher came up with this one? ur the MC? wow good luck! PS-come down on my blog or I'll tell people tht to who the red underwear actually belongs to.LOL. Thank you for making me laugh genuinely!! Blogrolling yah, Hope u wont mind..
i jus got this one sayin "a person under stress would find differences in the two dolphins"
i ask two dolphins??? to me both look like cows!!! P.S.-master of ceremonies?like headmaster, taskmaster what? 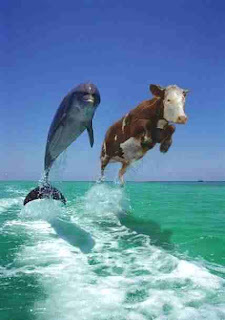 Those who find both dolphins are identical to each other, and both cows are identical to each other have a squint. I found only 1 dolphin. So I do not have squint. Plus as I did not find the second dolphin to compare with, I did not find any difference between the two. So I guess I am pretty confident about my gender. pls don't ask them this question at the wedding!